The number one most requested list Andrew and I get here at Reading Rants Central is: “Could you make a poetry list, PLEASE?” The main reason I put off writing this list is because it’s very difficult to try and describe a book of poetry to someone who hasn’t read it. So for each of these books, I’m including a sample poem, or an excerpt of a poem. I’m fairly certain that I’m not violating any copyright laws in doing so (after all, I am a librarian, and I did a little research on it) but if you happen to be reading this and you happen to be one of the poets quoted or an editor of one of these books and think that I AM violating your copyright, please contact me ASAP and we will remove the offending passage. Cool? Alright, already! Here it is–my fav. poetry picks for the adolescent angst crew. Now, give me some peace, peeps! As summer swings to an end, we could all use a little inspiration (especially after THIS summer) as we head back to school or work. Luckily, we don’t have to look far. Award winning poet Nikki Grimes has created a unique little book BIG on art, history and imagination that will pump up your heart and brain for the challenges of fall. Added bonus? It will fit neatly into that square front pocket of your backpack or briefcase. Because these poems aren’t just for kids or teens. They’re for anyone looking for a light in the darkness. Using the “Golden Shovel” form, Grimes took lines from famous Harlem Renaissance poets’ work and used them to craft her own original poems that reflect the chaos, complications and hope of our current world, and of the African American struggle in particular. Grimes also asked several of today’s leading African American illustrators (including Christopher Myers, Brian Pinkney, and Javaka Steptoe) to lend their visions to the pages, so each poem is accompanied by an original artwork that further uplifts the work. My personal favorite is this poem by Georgia Douglas Johnson, which in turn inspired an ode to family and endurance by Grimes called “Bully Patrol.” Short biographies of both poets and artists are included in the back in case you want to find out more about these titans of words. I’d honestly be shocked if you didn’t want to read more, or try the Golden Shovel for yourself. Happy reading, writing and autumn-ing! Ever since her older brother Noah disappeared, Molly feels like she doesn’t have a friend in the world except her service dog Pixel. So when Red, a fun-loving homeless teen and Christo, a super cute new guy, come into her life on the same day, she feels as though she’s hit the jackpot. There’s just two small problems: 1) Red suffers from schizoaffective disorder, which means she hears voices and sometimes sees things that aren’t there, 2) It’s nearly Christmas, and Christo has to leave the morning after their first date to fly to New York with his family for the holidays. Molly, whose parents have become zombies since her brother left, is determined to give Red the kind of holiday her family used to have before they fell apart. So while Christo is in New York, she tries desperately to worm Red’s real address or home phone number out of her in order to tell her mother that she’s okay. But when Red starts taking in earnest to the voices in her head, and Christo suddenly stops texting, Molly is forced to ask her checked-out parents for help and finally come to terms with what really happened to Noah. This heartfelt verse novel, full of bigger-than-life characters and surprising twists, is classic Sonya Sones. If you’re in the mood for a feel-good novel, complete with holiday cheer and sincere emotion, look no further. It’s the perfect gift to give or get any teen reader this holiday season. In this heart-breaking verse novel, Annaleah is devastated when she gets the call that her sometime boyfriend Brian collapsed on the basketball court at the park and died. Just like that, Brian is gone. The situation feels surreal and Annaleah is in a state of shock. “It was absurd/that I had dirty laundry/and that Brian/was dead.” She goes to his funeral, even though she’s never met his parents and doesn’t know his friends. Now Annaleah has to manage all the conflicting feelings she had for the boy she only dated for three months and who she was never really sure of. Of course she feels grief at all the things they will never do together: “I will never/take a trip with you./I will never/dance with you at prom./I will never/know if we had a future/beyond this summer./ I will never/know if you would have said,/‘I love you.’” But she also realizes that their short relationship was far from perfect. “I wonder what it would have felt like/to have a relationship with Brian/where I wasn’t always questioning/and worrying/and feeling so alone.” After spending the summer visiting Brian’s grave, nursing her sorrow and avoiding her friends, Annaleah begins to wonder who she is without Brian’s grief to bear. “Feeling sad/has kept me busy–/it’s been my job./And if I come here less,/what will I have?” But then she meets quirky Ethan at the pizza joint where she works and finds out a secret about Brian that casts their brief relationship in a whole new light. Can Annaleah put the past and Brian’s ghost behind her? Or will she allow the memory of her lost love to destroy her ability to make any new ones? 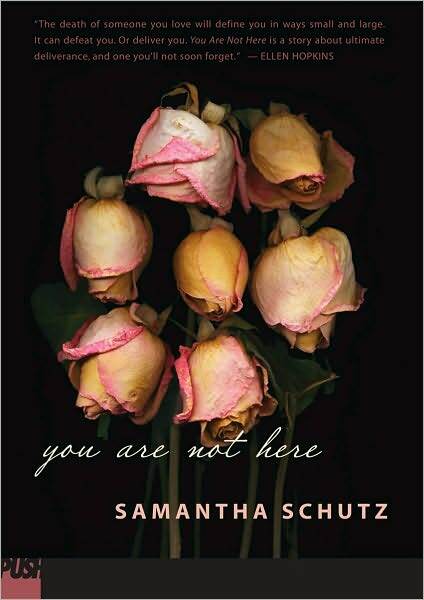 Samantha Schutz’s second book is a sad yet interesting look at the phenomenon of grieving over a relationship that never really was. 1 weepie. What it is: A collection of poetry by former and current teens, turned into a book by former ‘zine authors Watson and Todd. Short, (only 25 poems total) but so completely worth checking out, mostly for the amazingly cool/crude illustrations drawn by the eclectic compilers. What it ain’t: Trite, silly or over-the-top. Yeah, some of this stuff isn’t quite Pulitzer material, but it rings very true to this prior teen, who looks back at her own teen poetry journals and blushes, madly! Who will like it: Anyone dealing with the trials of adolescence right now, or having teen trauma flashbacks as an adult while lying on a therapist’s sofa. A Sample: The Pain Tree by Mark Todd/Can’t you feel it?/It hurts so bad!/You can’t?/What’s wrong with you?/How come you can’t feel it?/I don’t believe you./What do you feel?/Nothing!/No pain?/Just nothing, huh?/Well, let me tell you,/You’re missin’ out./It’s wonderful. What it is: Poems by women of different races and ages, arranged to document the female experience from youth ’til old age. What it ain’t: Despite the title, this isn’t pro-femi-nazi, man-hating stuff. (Sad to say, some of you still think the word “feminist” means that girls think they’re better than guys, and therefore hate their collective patriarchal guts. NO! It’s all about everyone getting equal pay for equal work–we should ALL be feminists, male or female!) It’s about being a girl and then a woman and all the stuff that is great about it, and, just to make it interesting, all the stuff that stinks about it. Who will like it: Rrriot grrls who rock out to Tori Amos, Ani DiFranco and Liz Phair, and the boys who love them. What it is: A collection of poems by nine masters of the spoken word form who perfected their art in the Brooklyn Moon Cafe and the Nuyorican Poets Cafe here in NYC. A short bio of each of these poets of color is followed by three or four samples of their work. Spoken word poetry kinda defies definition, but it’s a little like a story, a little like a song, and usually has a beat. It can be confrontational, contemplative, both, or neither. What it ain’t: the Beat poets of the 60’s! There’s still some finger snapping involved, but this modern spoken word is an organic kind of poetry that is still growing and evolving as an art form. Who will like it: Anyone and everyone who digs the stylins’ and profilins’ of the spoken word form. What it is: The cream of the crop of teen-penned poems collected from the terrific New York Public Library and Poets House teen program, Poetry in the Branches. Editor Dave Johnson led poetry workshops where teens could write/read/share their poetic endeavors. Johnson picked these 36 pieces to represent all the good stuff he heard. What it ain’t: Cheesy! This is sincere, from the heart poetry. Who will like it: Wanna-be published, currently adolescent poets. What it is: A collection of poems by many different people (some you may recognize as a famous writer or philosopher) that illustrate the difference (and occasional similarities) between truth and untruth. Editor Patrice Vecchione writes in her introduction, “Poetry is a particular way of telling the truth…Often a poem will say what you know is true but had never heard put into words before.” It’s pretty deep and kind of interesting to read these poems and try and figure out why the editor chose them for this book, and how they all go together. Vecchione was also nice enough to include brief bios about the poets in the back of the book, so if you liked the voice of any particular person, you can dig in and find out where to find more of their works. What it ain’t: No poetry in here by teens, folks. Just poems by professional and classical writers that adults thought you would like, and that may start your own writing wheels spinning. Who will like it: Razor-red lipstick wearing Goth girls who sneak copies of Emily Dickinson into their black-light lit bedrooms, and boys who play in serious bands (and I don’t mean Making the Band, gelled-hair poptarts!) who are looking for inspiration for their deep-down, soul searching lyrics. What it is: Uncensored, untouched, raw and real poetry by the usually silent half of the teenage population–guys. Editor and mom Betsy Franco decided early on that she wouldn’t try to push these poems into “themes” or “meanings,” but let them speak for themselves. And do they ever! There’s rash, brash, tender and moving poetry here from guys of all ages and from all over. What it ain’t: Completely G-rated. You may stumble upon a few, umm, maturely themed poems. This may be great, or terrible, depending on your age and point of view! What it is: A cool conceptual book of poetry that strives to answer the title question. Editor Naomi Shihab Nye chose poems about losing something, be it a real physical thing, or something ephemeral like freedom or innocence. But it’s not all sad and hopeless, some poems talk about the windows that open when the door of loss closes. Strategically placed black and white photos of people of different ages and races studying the camera with hard to read expressions add to the power of this interesting collection. What it ain’t: Hard to understand. Anyone can relate to what it feels like to lose something. We all have lost something important to us, and it’s usually a moment we never forget. Who will like it: Just about anyone, but especially crunchy granola girls, sensitive pony-tail guys, and aspiring photographers.